Women spend over $300 on skincare a month, or $3,756 a year. Over the course of their lifetime, those numbers equal out to about $225,000! Finding the right skincare products can be a bit of a tedious task, especially when it comes to finding one with high-quality ingredients. But what ingredients are good for the skin, and which ones can you do without? Collagen is one of those ingredients that are vital to skin health. If collagen is new to you, read on to find out why collagen is essential to having healthy, glowing skin. Collagen is a protein made by your body and is extremely abundant. It stems from the Greek word “kólla” meaning glue. It’s fundamental to the tissues that hold together your ligaments, tendons, muscles, and of course, your skin. Collagen is also present in your bones (up to 95%) and other organs. The production of collagen begins with procollagen, which is formed before collagen. Using a combination of four other elements, glycine, proline (amino acids, which are the building blocks of protein! ), copper, and vitamin C, collagen is made. How Does Collagen Help the Skin? Collagen is important to the skin in that it helps it maintain its youthful and glowing appearance. It’s the foundations of the skin’s elasticity and strength. An impressive 80% of your skin is built of collagen and is found in the skin’s middle layer. Collagen is the main part of keeping the flexibility in your skin. Another protein called elastin works with collagen to promote the skin stretching and bouncing back. When your a child and into your teens and twenties, your skin is healthy and firm. As you age, your skin will thin considerably as the production of collagen decreases. For each year in your mid-twenties, you lose about 1% of collagen. This decrease in collagen can cause the skin to lose its elasticity and strength and develop fine lines, wrinkles, and dry skin. Using a skin product that contains collagen or eating foods that have high amounts of collagen can reverse the signs of aging and give the skin a more supple look. How Can I Get More Collagen? Skin care products like creams or lotions that contain elements that increase collagen can be applied directly to the skin. Taking collagen internally can benefit other parts of your body, too, such as your heart, brain, joints, hair and nails, and muscles. Contrastly, eating foods that are high in sugar or processed damage collagen. Even getting too much ultraviolet light from the sun can decrease collagen, so wear your sunscreen every day! Smoking is another habit to break if you want to keep collagen production healthy and skin young-looking. It contributes greatly to fine lines, wrinkles, and other skin woes. 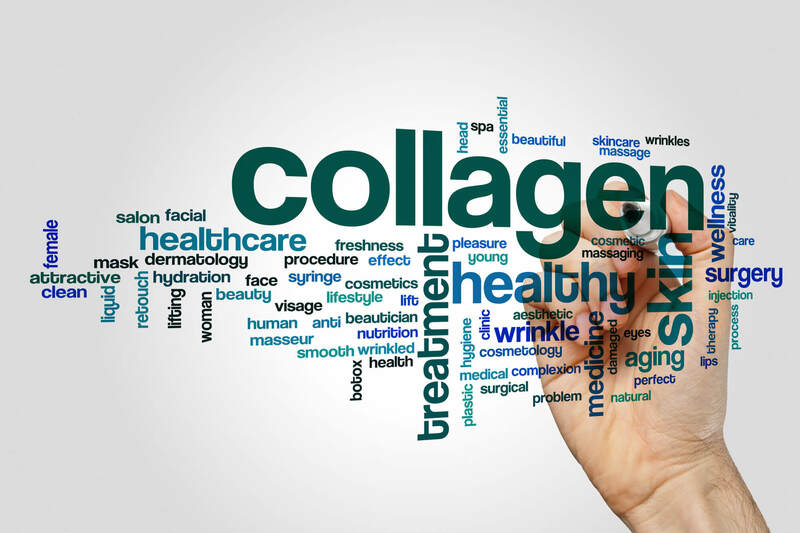 In the past few years, collagen has become trendy in the world of health and wellness. Collagen powders and supplements are now available at most health food stores or online. Collagen powders are convenient and make it incredibly easy to get collagen in your diet when you’re unable to eat well. Sprinkle powder in your daily smoothie, over oatmeal or yogurt or any other foods you may like. Collagen powder is hydrolyzed meaning the body can absorb it easily. One of the best ways to increase collagen production on the skin is to use vitamin C. Vitamin C is one of the four components necessary for procollagen to be made into collagen. Light therapy is also an option. LED and lasers inject lights of different colors into the skin to help promote new collagen in the skin as well as elastin. Continuing to give your body collagen throughout the years as you age is important, not just for the look of your skin, but for its health as well. Decide how you want to add collagen into your lifestyle and start seeing results! Plant-based and ethically made skin care is our specialty! Discover more on our website. Great article. You guys make it so easy to learn.